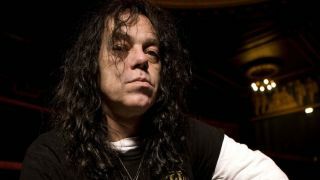 Ralph Santolla, the former guitarist with Death, Iced Earth and Sebastian Bach’s band, is to be taken off life support after falling into a coma following a severe heart attack. The guitarist was initially put on a ventilator to keep him breathing, but his son, Dorian Angelo Santolla, broke the news that he would be taken off life support on Wednesday June 6. In the wake of the news, Santolla’s mother revealed that the guitarist is an organ donor. Santolla played with several iconic death metal bands in the 90s and 00s, including Deicide and Obituary. He was also a member of Iced Earth and former Skid Row frontman Sebastian Bach’s solo band.